a capella, without accompaniment, at the Latin Mass every Sunday at St. Casimir. Ruth Kowalski spent many years as a child and teenager performing on the road with the Farnen Sisters, a song-and-dance act comprised of her siblings. In the 1970s, they sang with the Grammy-winning band Buck Owens and the Buckaroos. They also did several stage performances and even movies with Paul Newman and Bette Davis. A natural talent, Kowalski continued singing professionally until the early '80s, when the Farnen Sisters disbanded. Today, at 58, she lives in the Erie County community of McKean. But it wasn’t until she learned Gregorian chant at St. Casimir Church of Our Mother of Sorrows Parish, Erie, that singing lifted her into a deeply spiritual realm. This month, she will be chanting the age-old Advent and Christmas hymns Veni Emmanuel (“O Come, O Come, Emmanuel”), Veni, O Sapientia (“Come, O Wisdom”), and Puer Nobis Nascitur (“A Child is Born”). She describes the feelings that overwhelm her. 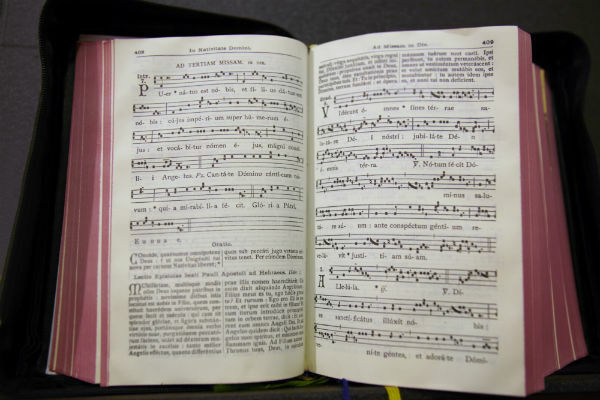 For more than 1,400 years, Gregorian chant has held what a 1963 Vatican II document (Constitution on the Sacred Liturgy, Chapter VI) describes as “pride of place,” or first place, in the Catholic liturgy. Its ancient sounds were first collected and codified by the music-loving Pope Gregory I during his papacy from 590 to 604 AD. The ancient sounds of Gregorian chant are not confined to the Extraordinary form of the Mass, or what is commonly referred to as the traditional Latin Mass. Chant also can be sung in all Catholic Masses, both in Latin and in English, and is even encouraged by the current Roman Missal, issued in 2012, as the primary accompaniment to the liturgy. As the traditional music of the Roman Catholic Church, it holds preeminence, but is not the principal music sung in most Catholic parishes in the United States today. Kowalski and her singing partner, Tim Clint, also of McKean, chant a capella, without accompaniment, at the Latin Mass every Sunday at St. Casimir. Only one other church in the diocese, St. Anthony of Padua, Cambridge Springs, offers the traditional Latin Mass. Once a month, Father Jamie Power, parochial vicar at St. George Parish, Erie, celebrates the liturgy of the traditional Latin Mass at St. Casimir and St. Anthony. He also enjoys chanting in English at St. George, where he invites the congregation to join him in singing the preface and the “Our Father” at Sunday Masses. At English-language Masses, priests are encouraged to incorporate chant where appropriate and helpful. Those clergy with a musical background and a good voice tend to feel more comfortable singing parts of the Mass. Latin Mass at St. Casimir and St. Anthony. Father Matt Kujawinski, pastor of Immaculate Heart of Mary Parish, Mercer, and Father Ian McElrath, parochial vicar at St. Joseph and St. Stephen parishes in Oil City, both have an appreciation of music and some musical training. 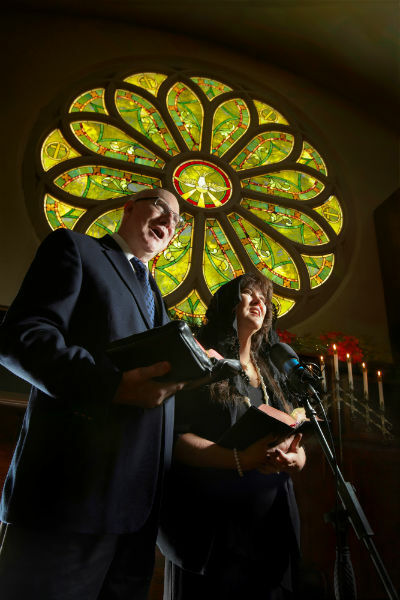 They enjoy taking Latin melodies and adapting them to English, particularly in the preface and at Communion. It can be so natural, they say, that people don’t even realize they are chanting in the ancient tradition of the faith. 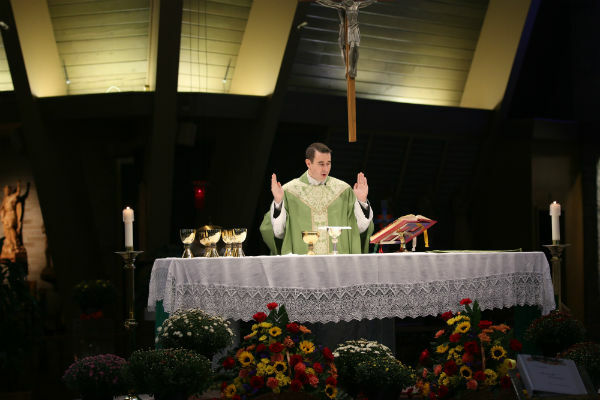 Since Father Kujawinski was ordained in 2003, he has used chant when offering Mass. After Vatican II, when the Mass began to be celebrated in the dominant language of the culture in which it was said, the Latin Mass and Gregorian chant began to slide in popular use. It was about that time that Tim Clint began to wonder where all the Latin hymns had gone. At age 25, he was president of the parish council and a member of the choir at Our Mother of Sorrows Parish in Ashtabula, Ohio. He had just visited a bookstore in Cleveland where he found several recordings of Gregorian chant. When someone in the parish choir told Clint that they were going to throw out the Latin chant music, he grabbed all the sheets and books, saving them for posterity. The unadorned quality of chant lends itself to what many people consider the mysterious, otherworldliness of the music. Usually performed a capella, chant is “pure melody,” according to Dr. Susan Treacy, professor of music at Ave Maria University in Florida. “Chant rhythm is free rhythm, that is, randomly alternating groups of two or three notes. You can’t beat time to it. You can’t march or waltz to it. It gives it a timeless quality because you cannot pin it down to a regular meter. That gives it a timelessness,” Treacy explains. Matt Clark also believes chant helps us focus on the meaning of our words of praise. “That is why the church gives chant ‘pride of place,’ because it always places the music in service to the words,” he says. Treacy points to Viderunt Omnes (“All Have Seen the Salvation of our God”), which is sung after the first reading in the last Mass of Christmas Day. In that song, a single syllable of the word “Lord” (Domino) is chanted using 51 notes.